Too open: bullying, overly materialistic, self-centered, engages in physical foolhardiness. Crystals: blood stone, tiger eye, garnet, ruby, onyx. Affirmations: I am connected to Mother Earth and feel the security of being grounded in the moment. I deserve the best life has to offer, all my needs are being met. My body is important to me and I nurture it constantly. Affirmations: I trust that all is well. Creativity is flowing freely through me. Affirmations: I own my personal power. I accept myself exactly for who I am. Affirmations: I am speaking my truth. What I say is worthy of being listened to. I listen to and acknowledge the needs and wants of others. Affirmations: The answers to all my questions lie within me. Imagination sparks my creativity. I trust my intuition. Affirmations: I am who I am and glory in that. I attune with my higher power. I am a unique, loving, radiant being. Minor Chakras are energetically powerful acupoints that are “reflected points” of the seven major chakras having similar properties to their more illustrious counterparts. 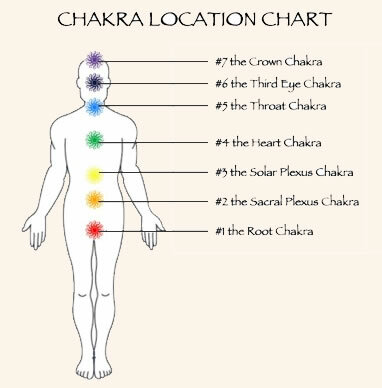 There are 21 Minor Chakras distributed all over the body. 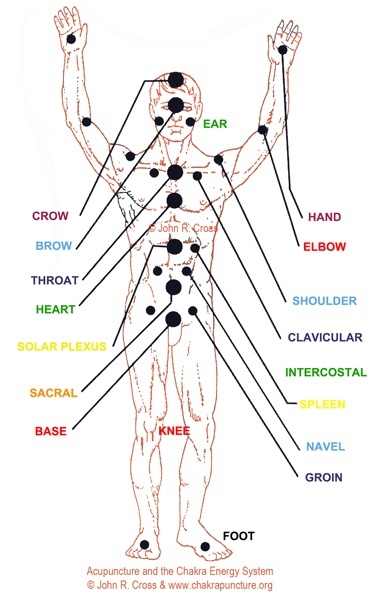 These 21 are further grouped into 10 bilateral minor Chakras that correspond to the foot, hand, knee, elbow, groin, clavicles, navel, shoulder and ear. These are about 3 inches in diameter and are 1 inch distant from the body.